One on the more recent additions to the park inventory in Portland is the neighborhood park for the South Waterfront Area. (see here and here for more on SoWa). The park is named Elizabeth Caruthers Park (after one of the pioneering founders of Portland - on whose original land claim the park now lies) this new addition offers another iteration of the national firm paired with local for park projects. As this site isn't one of those you 'happen to be near and want to swing by', it's been less on the radar than some other visible additions to the Portland landscape, which I will be showing off soon as well. I did see this a couple of times during construction, but had an opportunity and some sunny weather this weekend to swing by and snap a few images of the completed park. The $3.5 million park design was completed by Hargreaves Associates, along with local firm Lango-Hansen and artist Doug Hollis. Finished size is 2 acres, and the design plays off the proximity to the river, high density mixed use buildings, and the potential to be a flexible event space. "Urban Gardens: A community gathering area with movable tables and chairs and a built-in bocce court, a garden retreat area with granite seat walls and a historic marker honoring the site of Portland's first cabin, and an environmental play area with a spray/play stepping stone feature and seating logs. Naturalized Landscape: Boardwalks, naturalized plantings, undulating topography with stormwater detention, and Song Cycles public art created by Doug Hollis. Open Lawn: Flexible space, including an 8' tall sloped landform for seating, sunning, and play. 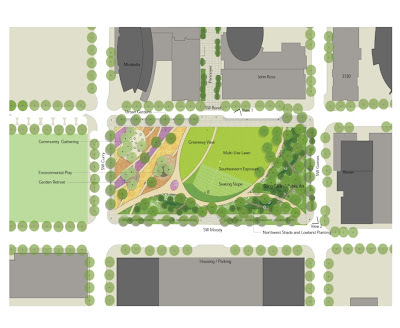 Other Features: A variety of trees and plantings, pathways with benches, park lighting, a festival edge on Bond, electrical infrastructure for events, bicycle racks, a drinking fountain, dog waste bag dispensers, trash receptacles, and streetscape improvements." The dominant feature of the park is the large open grassy area, which was being used mostly for dog walking. The sculptural mound, obviously is a typical Hargreaves signature, but seems restrained here as a backdrop and tilted plane that could work as amphitheater seating. While maybe 10 feet at it's apex, you don't feel terribly high up due to the flatness of the surrounding landscape. Dare I say the berm needed to be much larger and more dramatic to really have the impact in this sized space. The individual rooms contain such features as water play, sculpture, and interpretive elements all bordered by waves of plantings defining the spaces while allowing hints of what lies beyond. The water play was interesting as it was surrounded by rubber playground tiles (the slightly darker brown) for safety - and the individual pieces of the feature itself use two different rock textures for an undulating appearance. The waves of plantings give definition to the space, along with the curving pathways. This layering provides an interesting foreshortening of spaces adding to their comfort and intimacy.. The plantings and pathways also lead to other rooms, for instance this flexible seating area and bocce court. The ability to move furnishings around takes advantage of the user preference for where and in what configuration they sit. These seats surround a simple decomposed granite court (the same d.g. used for secondary pathways) again simply delineated with sparing use of stone. ... to the much more rigid straight boardwalks weaving through the south section. The shade is predominantly from the building directly south, casting a shadow almost completely within this zone - and giving a very different feel from the heat of the open lawn areas - probably even more so in the height of winter. The sculptural elements 'Song Cycles' by Doug Hollis are also dotted through this area, making for some visible movement and drawing the eye skyward. I was kind of disappointed with these - essentially an oversized bicycle wheel with some cups to catch the wind and swing them round. From the RACC website, they were "... Inspired by a historic photograph of bicyclists resting at a nearby site, these “Song Cycles” are activated by the wind." 'Song Cycles' from Jason King on Vimeo. These areas are definitely shady at mid-day, offering some relief from the heat. They do suffer from a lack of usable seating, as most of the paths are raised above grade with an occasional seat. Obviously meant to be moved through more than to linger, the shade and coolness makes it a refuge worth hanging around for and I wish there would have been a larger space carved out on this end mirroring the more sunny north side. Perhaps one must make due with just hanging your feet over the ipe decking into the water below? Aerial Tram from Elizabeth Caruthers Park from Jason King on Vimeo. Thorough review, thanks John. Am reminded of Tanner Springs Park in the Pearl District.